Chemical-containing whiteners or bleaching products, which change the color of teeth by removing deep and surface stains. You may have heard or read about tooth whiteners in magazine and newspaper ads, televised ïnfomercials¨and radio announcements. But how do you know which product is right for you? In-office whitening is done in the dental office. 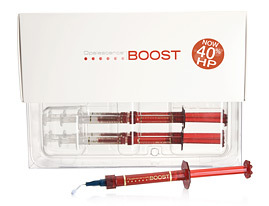 There are many in-office tooth whitening products available to dentists. These products are much stronger than the take-home bleach products, since in-office products have more hydrogen peroxide, the active ingredient. They are sometimes used with a light or laser. The in-office procedure is usually completed in about one hour. To help protect the mouth, the patient´s gum tissues are covered either with a rubber dam (a thin sheet of latex rubber that keeps the teeth dry during treatment) or a protective gel. Whitening toothpastes contain ingredients that help remove surface stains only. 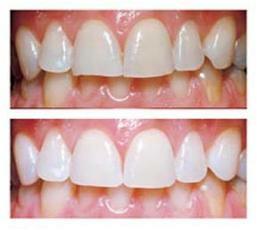 Unlike tooth-whitening bleaches, whitening toothpastes do not affect stains below the tooth´s surface. For that reason, toothpastes do not get teeth as white as bleaches do. Whitening toothpastes can be purchased over the counter, and several have received the ADA Seal of Acceptance. ADA-Accepted whitening toothpastes contain polishing or chemical agents that help remove surface stains through gentle polishing or some other non-bleaching action. Some toothpastes contain other agents, such as enzymes, that help dissolve surface stains. Home-use bleaching whiteners dispensed by dentists usually contain the active ingredient carbamide peroxide. Home-use whiteners are not as strong as in-office whiteners, since they are meant to be used over a period of days or weeks. If you use a product at home dispenses by your dentist, the dentist will first make special bleaching trays for you upper and lower teeth. The bleaching gel is placed in the trays, which are worn for short periods during the day or even overnight as specified in products directions or by your dentist or manufacturer. Home-use bleaching whiteners are also sold over the counter. Some are applied with trays, some by strips, some by a rinse and some by a brush. The most common side effects of chemical whitening products are temporary tooth sensitivity and mild irritation of the soft tissues in the mouth, due to the bleach. For a few days following treatment, your teeth may be sensitive to temperature extremes or the gums may have mild irritation. If this does not go away, see your dentist. Over-bleaching is typically the result of long-term exposure to bleaching agents. Over-bleaching can cause tooth sensitivity, a reduction in tooth enamel and mild irritation of the soft tissues of the mouth, particularly the gums. Do not use bleach products for longer than advised on the package and do not use them for longer than advised by your dentist. Some individuals with certain dental conditions may not be good candidates for bleaching. People with gum recession and exposed, highly sensitive root surfaces may find the whitening ingredients further irritate their teeth. If you have fillings, crowns, and extremely dark stains, talk to your dentist about whitening your teeth. A complete oral evaluation by a dentist will help determine if bleaching is an appropriate course of treatment for you. Your dentist then can also monitor the treatment plan. Maintaining the improved appearance of your teeth. Newly whitened teeth may absord stains more easily. To keep your teeth white as long as possible, avoid tobacco and stain-causing beverages (such as coffee, cola tea and red wine) for several days after whitening. Keep in mind that teeth usually return to their original shade over time. If you steer clear of tobacco and large amounts of stain-causing beverages, your teeth may remain bright for several years. Whatever the option you have chosen to improve the appearance of your teeth, it´s important to remember the basics of good oral hygiene. Look for oral hygiene products that display the American Dental Association´s Seal of Acceptance. Brush three times a day, floss or use another interdental cleaner one a day, and visit your dentist regularly to help keep your teeth healthy and bright. Just like snowflakes, no two smiles are exactly alike in their shape or appearance. We generally think of teeth as being white, but tooth enamel has many different shades. ingesting more-than-optimal amounts of fluoride while teeth are developing, before they erupt.